The Gamutgurus DevOps course will help you to curate all DevOps Engineer skills like source code management using version control tools, continuous integration using Jenkins and Continuous Deployment & Delivery with tools like Chef, Puppet, Ansible etc. You will learn DevOps with the Gamutgurus DevOps training course as per the tech industry demands and become a DevOps Engineer. What is DevOps, Acronym What is Dev & Ops? Acronym: Dev + Ops – misconceptions. Importance of DevOps Practices in Software Development. DevOps in Realtime and it’s goals. Overview of: Version Control mechanism, Build and Deployment Process, Continuous Integration and Deployment, Configuration management, Containerization, Virtualization, AWS Cloud platform ..etc. DevOps and Cloud. Is Cloud + something is DevOps? Overview of GitHub, GitLab, Bitbucket ..etc. DevOps Engineers favourite - CLI Or GUI? Setting up Mandatory Configurations. Best practices. Git Jargons understanding your understanding based on what you have learned so far. Let’s bring you in track to hit the Iceburg! If you have to give a short lecture on Git in Gamut Gurus, how much you can talk? Understanding Git as a tool and it’s internals. What is Source, Stage and Local repository. How Git generates SHA value? What is this checksum code and data integrity all about? Why such a long hexadecimal number? Significance of Staging Index. Then why git allows me to skip it. Skipping the staging. Chapter-5: Advanced Git. Let’s be more technical! - git log --grep ..etc. - Is deletion permanent? Best practices. What is a branch & tag ? When and Why do we create a new branch and tag? Importance of master branch & stable code. Why source code compilation is required. Understanding build output, test results, class files etc. Understanding various Environment and their usage: DEV, QA, SIT, UAT, Perf, STAGE, PROD ..etc. Understanding Tomcat startup scripts, deployment path, port configurations etc. Project-2: Automate complete build and deployment for real-time gamutkart application. DevOps certification at Gamutgurus is widely recognized across the industry which has helped 4000+ students get placed. Very Good institute and great learning experience. Nageswar sir is very experienced and extremely knowledgeable and this helps us to learn things in better way . Nageswar is the one who taken DevOps from very basics and he makes sure that complete batch goes in the same flow. He is an expert in teaching with real time examples. The Trainer is by far the best i ever had. Excellent knowledge and possesses great experience and skills. I have enrolled for DevOps training I Gamut gurus Technologies. My trainer Nagesh sir explains each and every concept clearly and briefly. Also gave assignments so that we can have proper hands on experience. I came here to find out the right path of my career and met Mr. Nageswar rao sir who has guided me to do well and study hard to compete in current industry. After his suggestions I did DevOps course and was able to move to the next level of my career thanks. I went for DevOps for Gamut gurus , the content and teaching methodology of Nagesh sir is very good. Highly recommended. 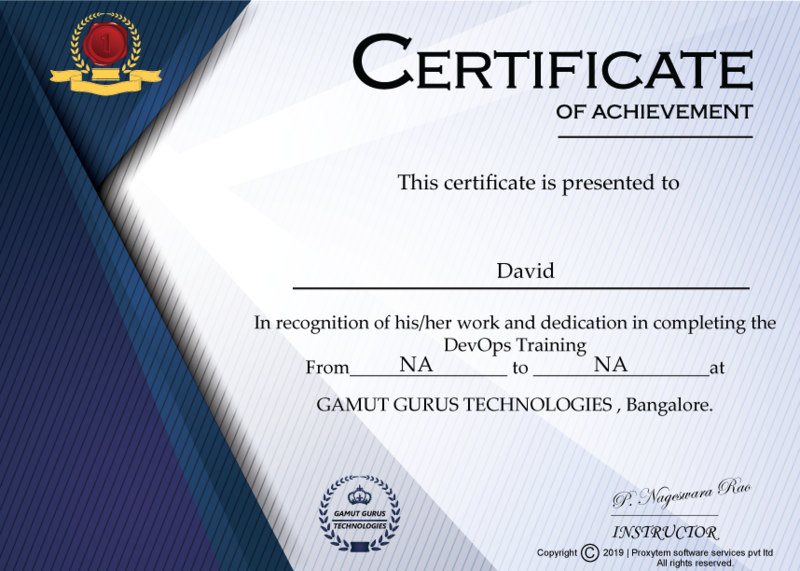 I have taken DevOps training in Gamutgurus. Training of Nageswara Rao is really awesome. We will get to know the core concepts with. real time scenarios. One thing I like here is minimal slides and maximum command line teaching. I took up an online DevOps course with Gamut Gurus to gain an understanding in DevOps engineer. Well-structured lessons and easy to follow and practice. Definitely would recommend. In this DevOps project you will be introduced to the DevOps pipeline demo in various industry domains like media, finance, medical projects and more. You will get hands-on experience in Docker containerization by deploying Jenkins, working with integration tests in DevOps, Project Reports and finance app configuration. Project 1 : Containerizing various frameworks and NGINX Application using Docker. Problem Statement : How to integrate the software projects deployed in diverse environments using Docker. Topics : In this Docker project you will containerize the software running in different environment like Node.Js, MongoDB, NGINX, and ASP.NET. You will first setup these frameworks and the NGINX application on Docker container and then run them on the individual containers. Project 2 : Using Git for version control and tracking of software. Problem Statement : How to ensure the changes on the website made by various developers is implemented. Topics : In this project you will be working on coordinating the work of multiple developers making changes to the website of an online pet’s store. You will focus on source code management, creating a repository on Git for all the codes created by various developers, Next, we check the status of the code, bring it to staging, then commit it, and view its status in log all within the Git repository. Push local repository into Git repository. Is the course material accessible after completion of the course? Yes, you will have lifetime access to your purchased course materials. Your gurus will help you with installing all necessary software/environment that will be required to execute practicals. Can I avail job assistance? Yes, after successful completion of your course, we will help you to curate your resume that will stand-out with your recently acquired skills. Also, we will conduct mock-interview sessions to help you prepare for your job interview. What are the different modes of training at Gamutgurus? There are two modes of training – Online instructor-led classes & offline classroom course. The course content for both are the same. Address: Beside A2B and Ayyappa Temple, Near sky-walk bridge, Marathahalli bridge, Bangalore – 560037, Karnataka, India.